NASA engineers inspecting the Mars helicopter. In July 2020, a United Launch Alliance Atlas V rocket will launch from Cape Canaveral Air Force Station in Florida en route to Mars. On board will be the Mars 2020 rover, but nestled within its belly will be a tiny, four-pound helicopter. Once at Mars and aloft, this aircraft will become the first to fly above the surface of an alien world. 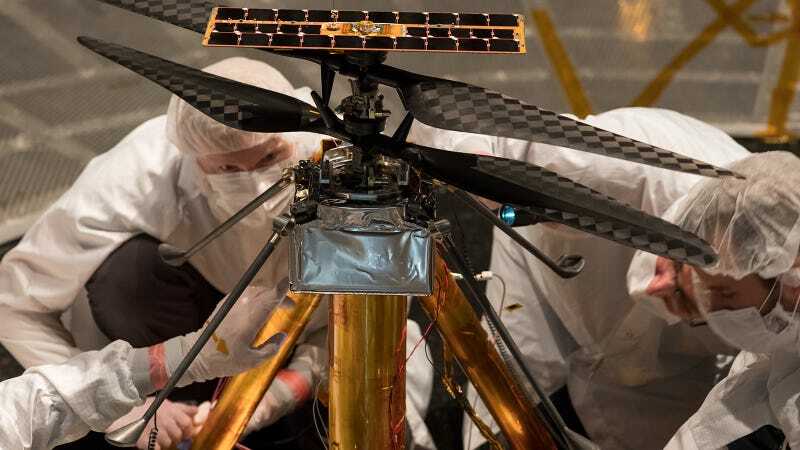 Engineers at the Mars Helicopter project at JPL in Pasadena, California, have reached an important developmental milestone, in which a model of the helicopter was put through a series of critical flight tests, reports NASA. The little chopper achieved controlled and sustained flight in simulated Martian conditions—a good sign that it’ll perform on the Red Planet as expected. The demo vehicle used in the flight tests. The Mars helicopter is fairly barebones, featuring few bells and whistles. NASA is describing it as a “technology demonstrator”—a real-world (or real-alien-world) test of the system. Results from the test will be used to inform the development of more sophisticated flying aircraft meant for Mars. Like a helicopter with a camera, for instance. Which would be so cool. Indeed, building a chopper for Mars is a major technological challenge. The device has to be able to withstand the extreme temperature fluctuations on Mars, including at night when the temperature dips to below minus 130 degrees Fahrenheit (minus 90 degrees Celsius). Each of the craft’s 1,500 different components, comprised of aluminum, silicon, carbon, foil, and foam, will have to endure the contractions and expansions wrought by the dramatically changing environmental conditions. The Mars Helicopter team preparing the craft for tests. The capacity for flight is dependent on the presence of a medium, which provides the necessary lift. Earth’s atmosphere is fairly thick, but the same cannot be said for Mars, where the atmosphere is super thin—a mere one percent of what it is here on Earth. To be fair, such conditions do exist on Earth, but at an altitude of 100,000 feet (30,480 meters). Not wanting to test their little helicopter at such an extreme height, the NASA engineers recreated these conditions inside the JPL Space Simulator. In preparation for the flight test, all the gases were sucked out from the 25-foot-wide vacuum chamber and replaced with carbon dioxide, making it just like Mars. Happily, the chopper was still able to get off the ground, which it did for around a minute, attaining a modest altitude of two inches. Another issue with Mars is its low gravity, which is approximately 38 percent of Earth’s gravity. On Mars, the four-pound helicopter will be closer to 1.5 pounds, dramatically altering its flight profile. Simulating this low gravity was considerably more challenging, but NASA did it by using a “gravity offload system.” In tests, a motorized strap was connected to the top of the helicopter, providing an assist equal to the missing 62 percent of Earth’s gravity. So, with 75 minutes of test flights in the books, and with a chopper seemingly ready for the rigors of Mars, this stage of the certification process is complete.